Musk melon also known as Cantaloupe/Honey dew/Mash melon in English, Kirni pazham in Tamil, Kekkarikke Hannu in Kannada and Kharbooja in Telugu and Hindi. It is low in calories and a best summer drink. Last year I posted musk melon @ Cantaloupe juice recipe from my Mil’s hands.This year, I tried on my own. 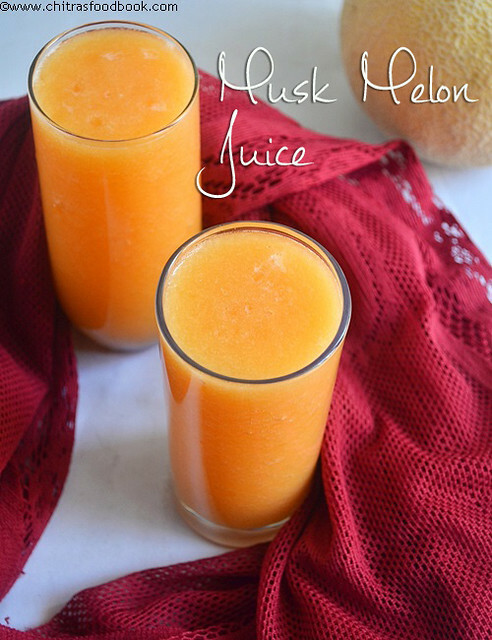 Here in Bangalore,we get orange colored musk melon.I love that color a lot.As summer is almost in peak,we really feel like having a fresh fruit or juice/ice creams in the noon.So i am trying lot of juice recipes and planning to share them in my space. 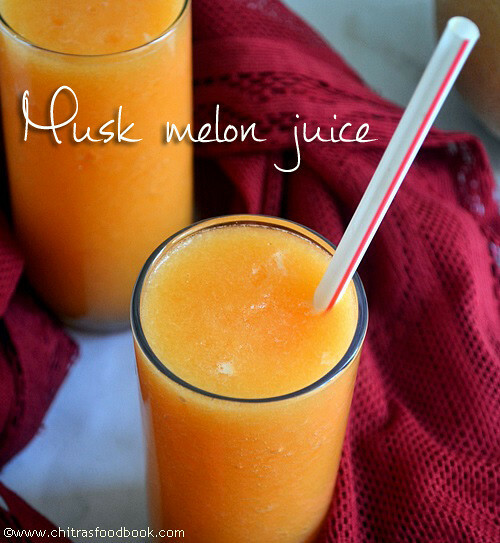 To start with, musk melon is one of the best coolants for summer and a great thirst quencher too. Its health benefits are innumerable. The biggest advantage is that it is low in calories, low in saturated Fat and very low in Cholesterol. It is also a good source of Dietary Fiber, Niacin, Vitamin B6 and Folate and a very good source of Vitamin A, Vitamin C and Potassium. It is good for asthma, diabetes, arthritis, High BP, heart disease and heat strokes. But the only bad thing is that a large portion of the calories in this food come from sugars. So its better to add less sugar while you make the juice to cut down calories. If you feel the sweetness of muzham pazham is sufficient enough, you can completely skip adding sugar OR replace with jaggery / honey. Do try this yummy & healthy summer drink recipe. 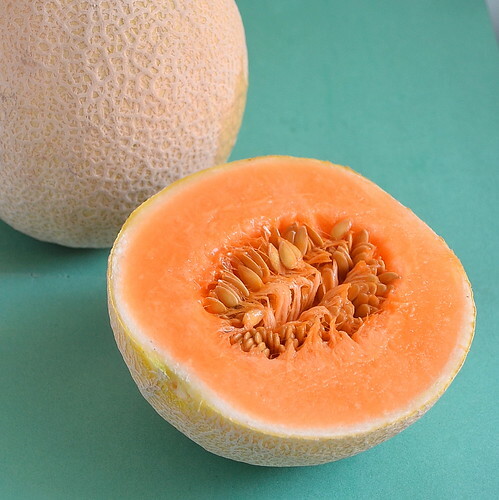 U’ll feel refreshing ..
Wash and cut the musk melon into two halves.Scoop the seeds out.Remove the pulp using a ladle. Take them in a mixie jar,add sugar and lemon juice(if using).Beat well.Check the consistency and add little water if needed.Serve in a glass adding ice cubes.Enjoy ! For variations replace water by boiled and cooled milk to make a milkshake. But add more sugar or palm jaggery. Tastes rich. If you add milk, do not add lemon juice. Use cardamom powder if needed. 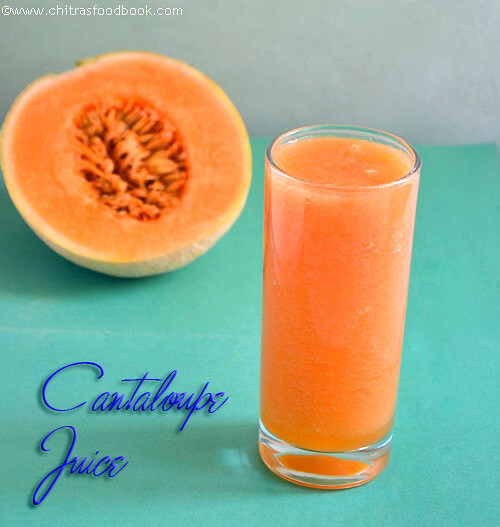 Technorati Tags: Musk melon juice recipe,juice recipes,Summer drinks recipes,Summer special recipes,Cantaloupe juice recipe,Kirni pazham juice,Musk melon benefits. 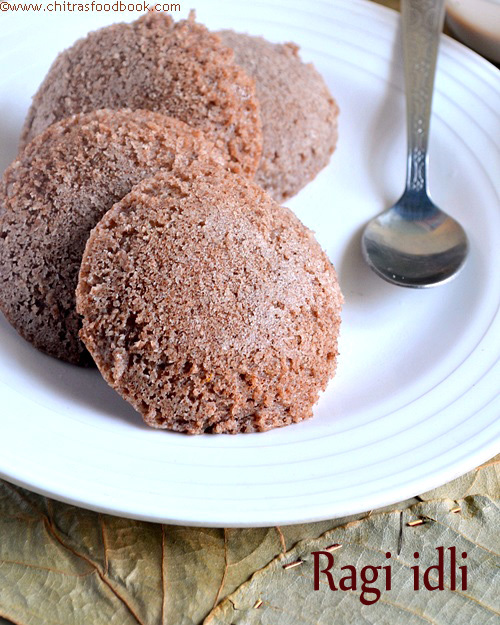 Ragi adai /Finger Millet roti recipe was in my try list for long time.Its a healthy breakfast/dinner recipe for diabetic and for people who wants to lose their weight.I have discussed its health benefits at the end of this post.Don’t forget to have a glance.Here i have shared “How to make-sweet ragi adai and spicy ragi adai”.I make my MIL’s spicy adai usually adding buttermilk.But this time,i got these recipes from my friend Shalini.As she is in diet,she is having more of ragi recipes.She suggested me to try this once and she guaranteed that this adai would come out super soft and stays soft for long time too.Usually she makes this adai for lunch and have the same for dinner too.By imagining its softness,i got tempted to try.I tried for the first time and as she told,it came out very well.Sendhil is not a big fan of ragi roti as it becomes hard after cools down. But when i prepared in this way,he loved it like anything and told me to make it more often.This shows the success of this recipe,isn’t it ..I heard some people add drumstick leaves and vegetables in spicy adai.I must try that way soon to make it more healthy.U don’t need any specific side dish for this adai.Onion raita or masala raita would do ! Do try this soft ragi roti roti.U’ll love it and i am sure u will include this in your breakfast or dinner routine.Even bachelor’s can try and have this healthy recipe in your menu. Check out my Instant Ragi dosa and Ragi biscuit if interested ! 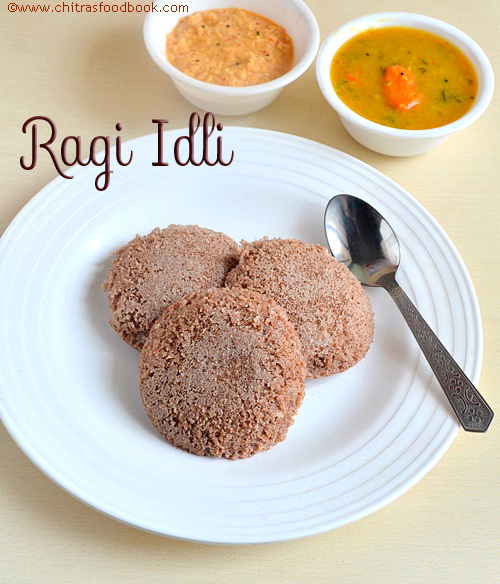 How to make soft ragi adai - sweet and spicy versions ! In a kadai,melt jaggery adding the mentioned quantity of water.Strain after it melts.Again heat the syrup. When it starts to roll boil,add the grated coconut & cardamom powder.Boil for few seconds.Now simmer the flame completely and add the ragi flour.Stir it quickly without any lumps.It will become a whole mass and leaves the kadai. Switch off the flame and allow it to become warm.When it is warm.grease ur hands with gingely oil and knead the dough very well.It would become a soft ball.Keep it covered till use. Take a polythene sheet,make balls from the dough and pat it thin.Heat dosa pan and drop the adai.Apply little oil around and cook in medium to high flame for a minute.If u flip it quickly,adai may break because of its softness.So cook till firm.Adjust the flame accordingly.Cook both sides.Remove and serve hot ! Soak tamarind in little water and take the extract. In a kadai,heat oil and temper mustard,urad dal,channa dal.Saute onions,green chillies,curry leaves adding salt and hing. Now add the tamarind extract and the remaining water.Total water quantity should be 1.3 – 1.5 cups based on the quality of flour. Add turmeric powder,sambar powder and the required salt.Let it boil for 2 minutes. Now simmer the flame completely and add the ragi flour stirring the water in one hand.It will become a whole mass.Keep it covered till use. Switch off the flame and after it becomes warm,knead it well to make a dough. Make balls and pat in polythene sheet for the desired thickness.Grease ur hands with oil whenever necessary. Heat a dosa pan and cook this ragi adai on both sides adding few drops of oil.Allow it to cook till it becomes slightly firm else it will break when u flip.Keep the flame high if needed.Cook on both sides.Remove. Serve hot with raita ! 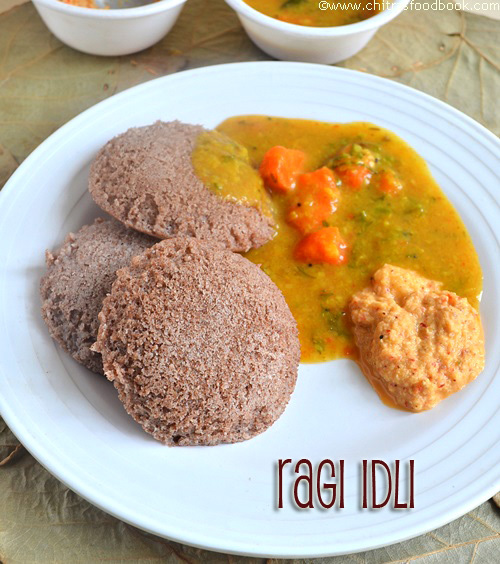 For this spicy version,adding tamarind is purely optional.But it adds a nice tangy taste to this bland ragi adai. U can make it much more easy and simple by adding just finely chopped chillies instead of sambar powder and tamarind extract,It tastes great in that way too. Also this adai may break while u flip.Its because of its softness.To overcome this problem,cook the adai in medium to high flame for 1-2 minutes and see that it has become firm.Then flip it.It will come out well. Please do not cook in very high flame as it may burn the adai. For variations,u can add finely chopped vegetables in spicy version. As i mentioned in my Holi lunch menu post,here is the yummy aloo methi recipe ie,Potato with fenugreek leaves which is a great side dish for roti and rice.I have tried this many times and its my favourite too.No doubt any dish with potato tastes great .Addition of methi leaves makes it more healthy and flavourful.I don’t follow a particular recipe.I make it based on the ingredients i have in my pantry.Sometimes i make the same with kasoori methi & baby potatoes too.It turns out well.But in this post,i have shared the basic aloo methi curry recipe using fresh methi leaves.Do try this recipe.Its a yummy side dish for dal rice and curd rice.It also goes well with our South Indian Sambar sadam and Rasam . Do refer my baby potato masal curry if interested . Aloo methi curry recipe - yummy side dish for rice and roti ! Wash and pressure cook potatoes by slitting into two for two to three whistles.Remove and peel the skin.Cut into cubes. Wash and chop the fresh fenugreek leaves roughly. In a kadai,heat oil and splutter jeera.Add onions and ginger bits.Saute well till onions turns transparent. Add methi leaves and saute till it shrinks in quantity.Add salt,turmeric,red chilli powder, coriander powder & garam masala powder.Mix well..
Add boiled potatoes.Stir well till masala coats it well.Leave in low flame for 4-5 minutes stirring twice in between.Remove and add few drops of lemon juice.Serve hot with roti,rice ! 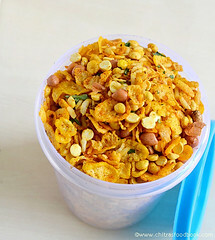 For variations,use sambar powder instead of red chilli and dhania powder. Adding garam masala pwd is optional.Skip if u don’t like. I loved adding lemon juice at the end.It help to balance all the taste.But add less..
U can also use kasoori methi instead of using fresh leaves.In that case,use 2-3 tbsp crushing in ur hands. U can always use baby potatoes in place of bigger ones.For this recipe,u can add 10-12 small ones. Serve with hot rice,dal tadka & papad.Tastes great ! Wish you all a very happy Holi . 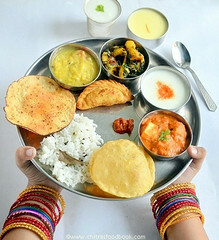 Here is a small collection of Holi Festival foods. 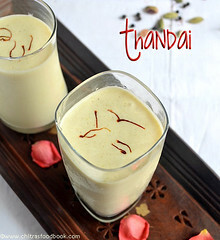 I have shared the links of some easy and yummy holi sweets, snacks, desserts and drinks and lunch menu ideas. Choose n try ur favourite ! Plan ahead from this collection based on the cooking time & preparation time in hand, get the ingredients and make it. Enjoy this colourful day with your loved ones !. Holi Picture source and credits :http://wallpapershd3d.com/holi-wallpapers/ via Google image search. Catch u all in my next post, Bye for now. Happy Holi !